in the quality manufacturing & exporting of the wide-ranging Hand Tools, Wood Working Tools, Garden Tools, Machine Tools, Automotive Tools, Leather Products & Scaffoldings. With the decades of experience at the backrest, Ludhra Overseas was configured by Mr. Vinod Ludhra (Managing Director) & Mr. Varun Ludhra (Exports Director) on keeping 'Quality' & 'Economy' as the basic parameters to the sound foundation. At Ludhra Overseas each of the produce is professionally managed from the designing at the in-house Design room to the final production. 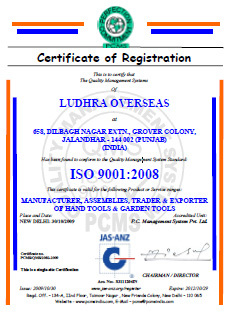 Selective in the choice of raw material, Ludhra Overseas produce undergo stringent quality testation at the quality control department for the users benefit. & timely deliveries, Ludhra Overseas enchases the skin -deep appreciations bestowed by the clientele that exhibits the success experienced.